You'll have to discover the mysteries that are buried deep under the surface of the water in this exciting game. Click here to play! 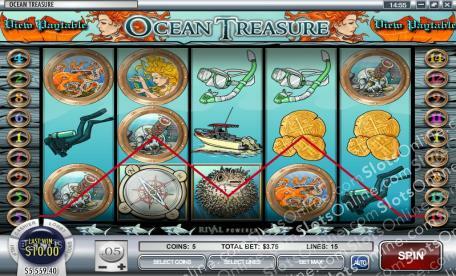 Dive to the ocean floor to uncover hidden treasures and win plenty of cash! This certainly isn't a mission for the faint at heart. There will be plenty of dangerous creatures to watch out for while you're swimming to the depths, including the puffer fish. Watch out for this spinney fish as it acts as a wild symbol. If you spin two to five of him across an active pay line, you'll get up to 5000 coins. Also keep an eye out for the diver. He's a jackpot symbol and will bring in up to 1000 coins. Catch a glimpse of the mermaid and win up to 400 coins. There's also the octopus, skulls, gold doubloons, boats, scuba divers and snorkeling equipment to help you in your quest to uncover the mysteries of the deep. The compass and giant clams are two particularly important symbols in this mission as the former triggers free spins and the latter triggers a bonus round that will help you bring in plenty of sunken treasure. Are you brave enough to search the ocean floor? Dive through these murky, blue waters for a chance to win big! The compass not only guides your way, but it also acts as a scatter. Three to five of these anywhere on the board will get you 10 free spins. The puffer fish is a wild symbol. If you spin two to five of these and you'll get up to 5000 times your line bet. It will also replace all other symbols, excluding scatters and bonuses, to create more winning combinations. If it appears in a winning line, it will double the prize. The giant clam will trigger a bonus round if you spin three or more anyhwere on the boad. During this game, you will select a number of pearls (depends on how many clams activated the game) from nine clam shells. Each pearl is worth a certain amount of coins and all of selections are added up to become your bonus prize.